Each year, Phyllis Schlafly Eagles hosts an Eagle Collegians Leadership Summit in Washington, D.C. College students from around the country participate in this unique event with speakers, members of congress, and panelists from all across the country and the spectrum of conservative work. 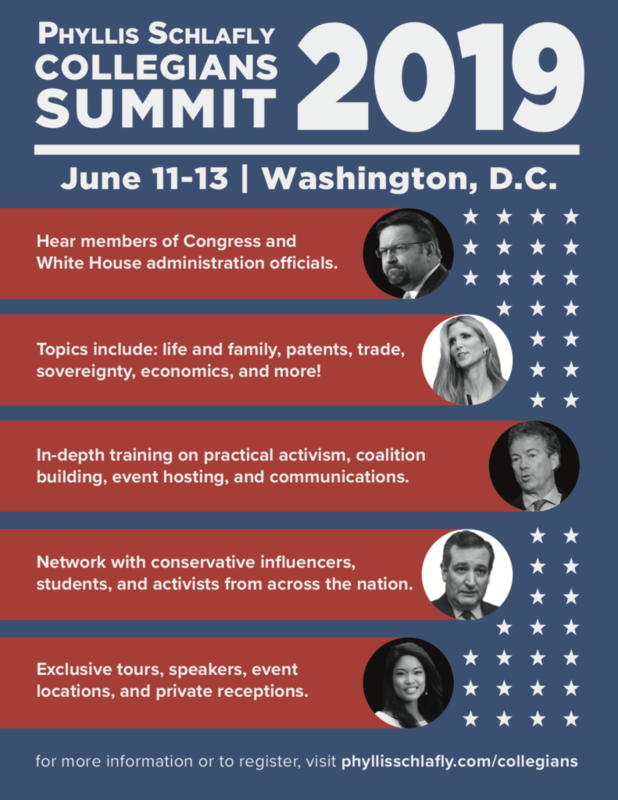 The 2019 summit will be our 26th annual event! We are anticipating an excellent conference off the heels of 2018’s great success. This is a FREE event for rising freshman, under graduate, and graduate students. A limited amount of travel and lodging scholarships are also available. Limited number of travel and lodging scholarships available. Only 40 are given each year. If you are applying for a scholarship, please select the appropriate registration above and then email the following information to info@phyllisschlafly.com. Please use “2019 Scholarship Application – [Your Name]” as the subject line. 1) A video or written essay (details below). 2) One letter of recommendation from a Phyllis Schlafly Eagles leader, a professor, or a mentor. 1) What makes you a conservative? 2) Why do you want to come to the Summit? 3) Describe any personal experience you have had (if any) standing up for your conservative beliefs. Email us with questions at info@phyllisschlafly.com, or see our flyer below.